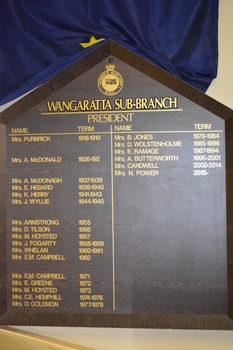 Wangaratta RSL Sub Branch - Women's Auxiliary Honour Board of Presidents from 1918 to the present day. On the 18/5/2018 the Women's Auxiliary celebrated its Centenary and is believed to be one of the oldest if not the oldest Women's Auxiliary in Victoria. On the 18/5/2018 the Women's Auxiliary celebrated its Centenary and is believed to be one of the oldest if not the oldest RSL Women's Auxiliary in Victoria. 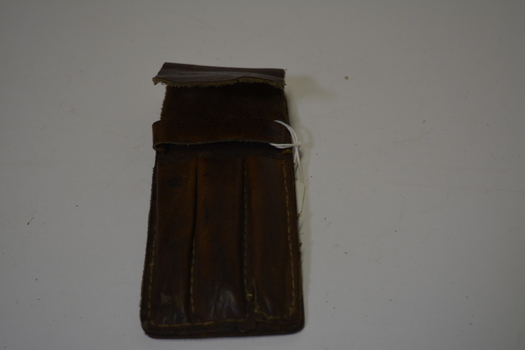 Item donated by Eric Hamilton VX42389 who served with the 2/32nd Australian Infantry Battalion in the Middle East and at the battle of Tobruk which lasted 241 days in 1941. 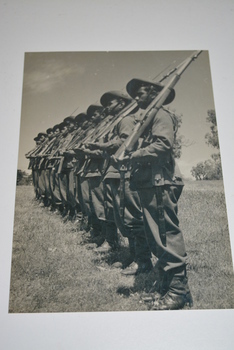 Black and white photograph of all aboriginal platoon in single file holding rifles. Image relates to a "special platoon" based at No 9 Camp Wangaratta as being the Australian Army's first all Aboriginal Unit formed in 1940. The soldiers were all volunteers mainly from Lake Tyers in Victoria. 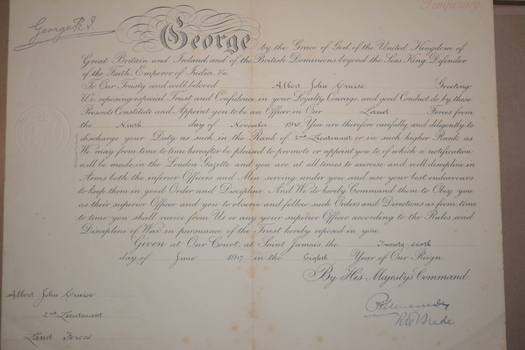 Yellow and brown cardboard covered booklet with RSL crest and type. 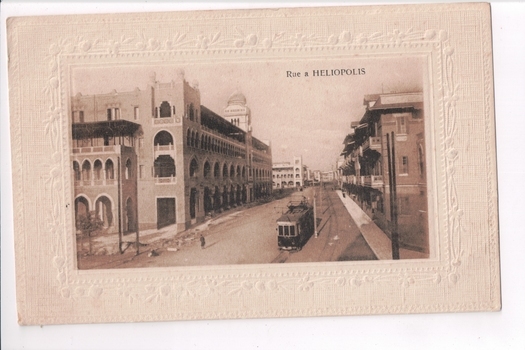 Postcard with a sepia photograph of a city street scene. Handwritten message on the back. 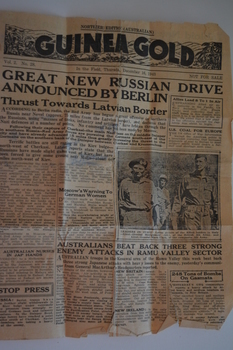 Two page cream coloured newspaper with black print and photograph. 5th Pioneer Battalion. 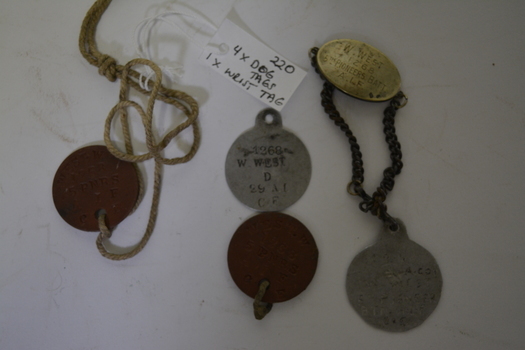 Five WWI dog tags, one brass, one homemade silver metal, one silver metal and two brown leather. These items are related to a photo album which was owned by W. West, reference number 208. Gruman Avenger. 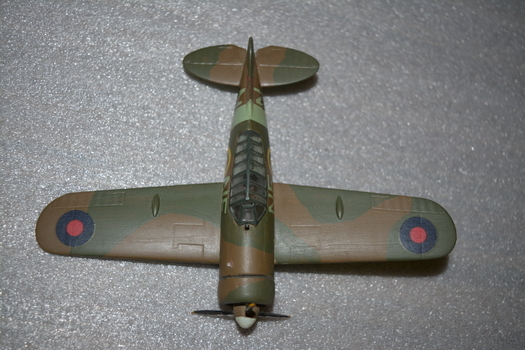 Small brown and camouflage plane with black and red spots on wings. Yellow, white, blue & red circles on sides. Black scabbard for a pattern 1907 bayonet. Attached to a red wooden board with a Japanese sword, another bayonet and a curved sword and three other scabbards. Framed Photograph - Col. H J SHANNON D.S.O.,V.D. First President Wangaratta RSL 1928 Colonel H J Shannon D.S.O., V.D. Col. J. J. Shannon D.S.O., V.D. 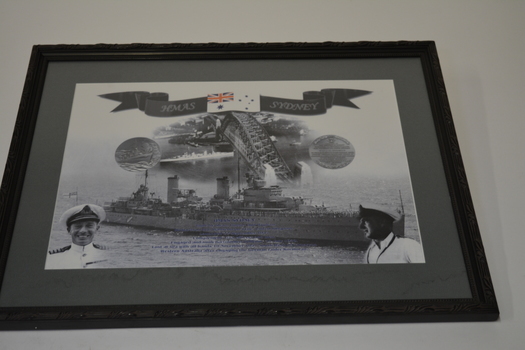 - First President Wangaratta RSL. 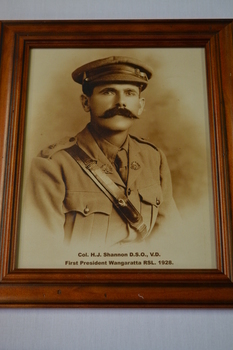 1928 Colonel Shannon became the 1st President of the Wangaratta RSL when it was organised under Anzac House and the present constitution. He was born at Bowman's Forest in 1874 and died in Wangaratta in 1960. He served in the Victorian Mounted Rifles at the turn of the century, rose to the rank of Captain and commanded the Wangaratta Detachment and Company - this later became the 8th Light Horse Regiment. In 1915 he embarked as Major in the 8th Light Horse and served in Gallipoli, Sinai, Palestine and Syria whee he commanded the 8th Squadron. Later he was promoted to Lieutenant Colonel and commanded the Regiment. During the Amman raids, he won the D.S.O at El Salt. 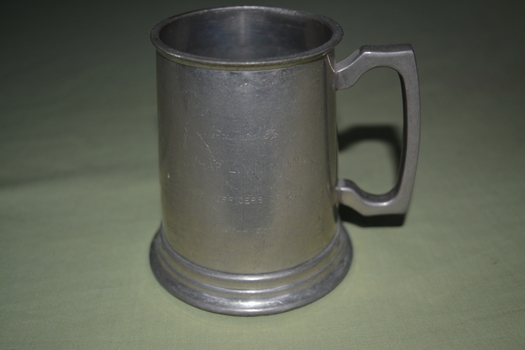 This award was presented to him by the Duke of Clarence. 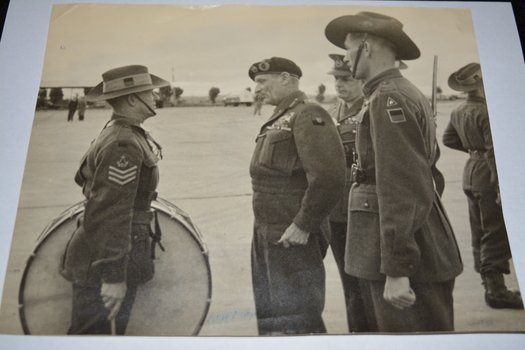 In post war period he commanded the 8th Australian Light Horse and later as Colonel of the 3rd Cavalry Brigade During the second world war Colonel Shannon came from retirement to organise the V.D.C in North East Victoria. 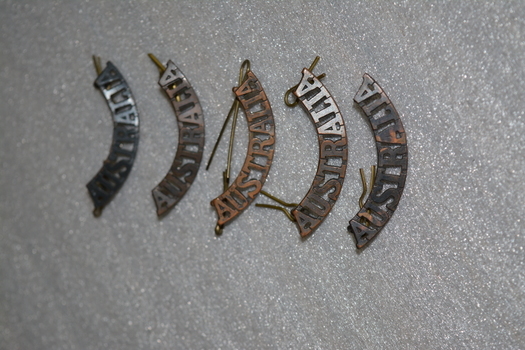 Three metal "Australia" badges with metal pins at side. 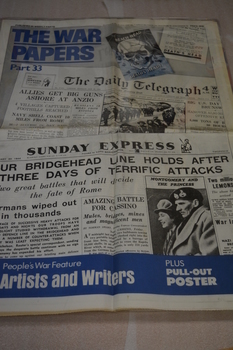 The Daily Telegraph Newspaper, "The War Papers, Part 33". Print is black, white & blue. 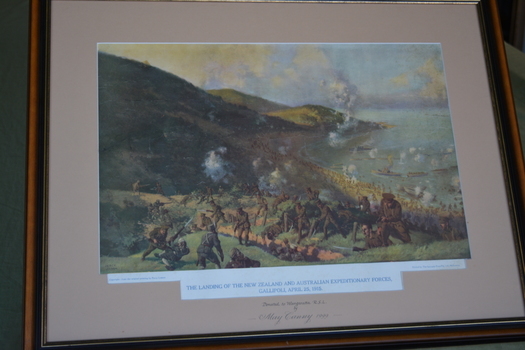 Brown timber frame with light brown mount containing print depicting soldiers landing on shore from ships at sea. 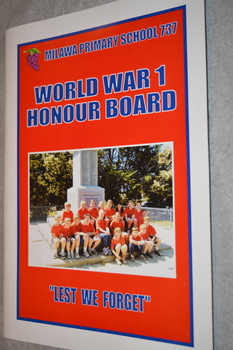 In 2005 the children of Grades 4,5 and 6 of Milawa Primary School researched and compiled personal stories, photographs and service records to honour those listed on the Milawa State School WW1 Honour Board. Inside rear cover contains a colour patch index to the following:- Andrew Robert BARRIE 3757/ Ralph Augustus CECIL 1677/ John COLEMAN 4089/ Arthur John Victor CULPH 896/ Edward Heathcote CULPH 2629(1447)/ Henry John CULPH 3108/ Thomas Wilson CULPH 34A/ Edward Frederick DOIG 3991/ Ernest Hugh DOIG 2937/ John Harold FOWLER 4488/ William Joseph FOWLER 3233/ Howard Fraser GRANT 7077/ Joseph Henry HOWELL 7247/ Frederick John HUMPHREY 2472/ Stanley Gordon HUMPHREY 3553/ Roy Curtis KENNEDY 5401/ Charles James KETTLE 29741/ Michael McGRORY 5390/ Ernest Phillip McPHEE 50339/ Stanley Charles McPHEE 3741/ Thomas MURDOCH Lieut/ William Lawrence PURDON 3223/ Ludin James ROBERTSON 980/ William Francis ROBERTSON 981/ Harold Ernest THOMAS 966/ George Ernest Vincent WOODBERRY 2173. Book is dedicated to all the service men and women in the Australian Armed Forces who continually strive to protect the Australian way of life. 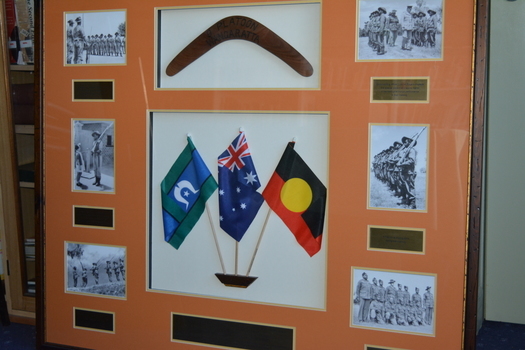 Dedication to the Aboriginal soldiers who formed a special all volunteer platoon at No 9 Camp Wangaratta in Victoria from late 1940 until February 1941. No 9 Camp was set up at the Wangaratta Showgrounds to allow the formation of the 2/24th Australian Infantry Battalion prior to leaving for Egypt. Major Joseph Albert Wright a WW1 Light Horse veteran was in charge of this platoon the only Aboriginal squad in the Australian Military Forces at that time. Aboriginals from Lake Tyers enlisted at Caulfield between June and July 1940. 7 of the 13 who enlisted in June 1940 were discharged as members of the 2/23rd Battalion. 10 were discharged on the 22/3/1941 as Services No Longer Required, 1 discharged in November 1940, 1 in January 1941 and another in April 1941. Dedication to Aboriginal soldiers who formed a special all volunteer platoon at No 9 Camp Wangaratta in Victoria from late 1940 until February 1941. No 9 Camp was set up at the Wangaratta Showgrounds to allow the formation of the 2/24th Australian Infantry Battalion prior to leaving for Egypt. Major Joseph Albert Wright a WW1 Light Horse veteran was in charge of this platoon the only Aboriginal squad in the Australian Military Forces at that time. 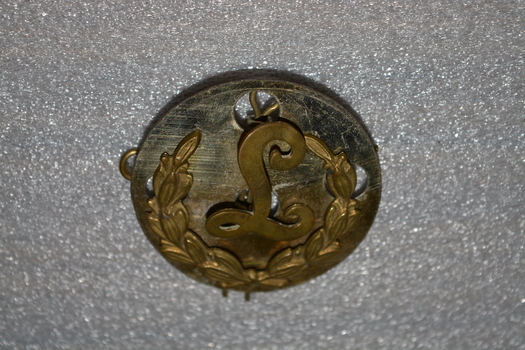 Badge - Large Gold "L"
Large gold coloured metal badge, possibly for a hat or to attach a sash. Has an "L" in the centre and leaves on the bottom. The "L" is removable. A large "L" which is removable in the centre. 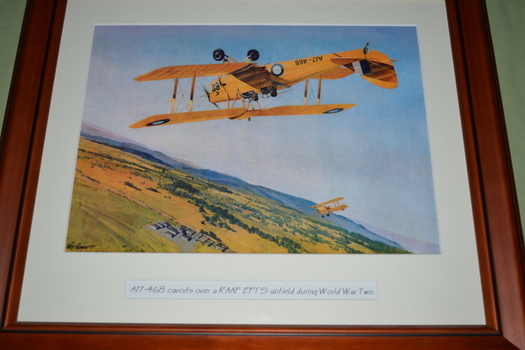 During World War II, the RAAF established twelve Elementary Flying Training Schools (EFTS) to meet the rapid demand for pilots in an expanding Air Force. Due to a shortage of pilots, observers, wireless operators and gunners, the Dominions of the Commonwealth agreed to establish a co-ordinate scheme to train 28,000 air crew each year to help England fight the war in Europe. It was known as the Empire Air Training Scheme (EATS). The Dominions would supply the trained aircrew and the mother country would provide the aircraft. Two page cream coloured newspaper with black print. 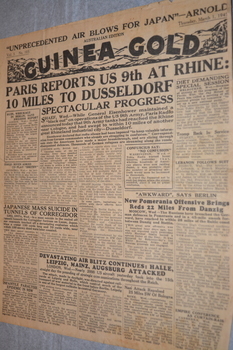 Two page newspaper containing news from home. Hawker Demon. 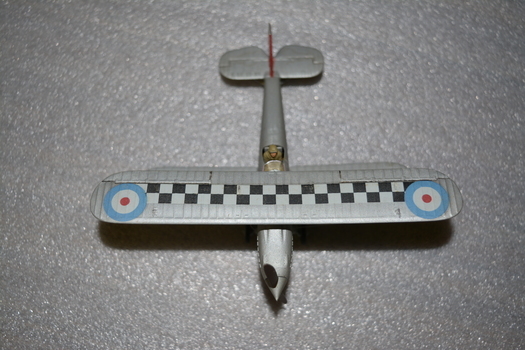 Silver bi-plane with red, blue & white circles & black and white checks on top wing & on both sides. Red, white & blue tail fin. Sopworth Pup. Camouflaged two winged plane with red, white & blue circles on top wing. Has red, white & blue stipes on tail fin. 1 on top wing & on sides of plane. 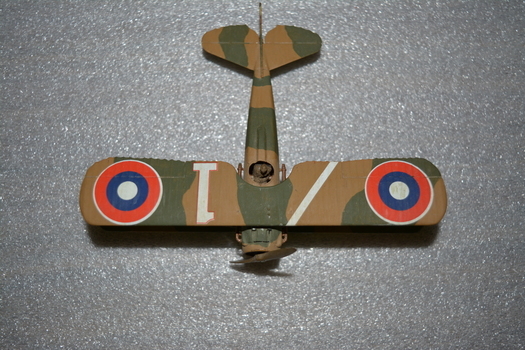 RAAF Fitters Manual II.E belonging to L.A.C G. Bulluss. Book has black binding with black cord to bind it. Cover is a dirty cream colour with black writing. 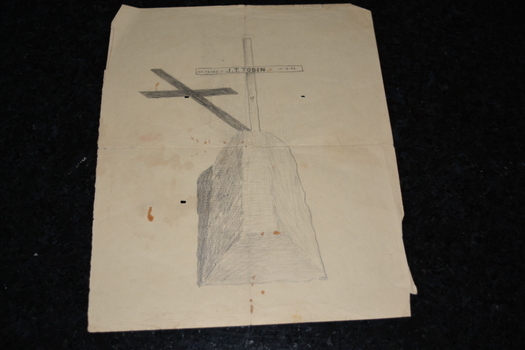 On front cover in two drawings in ink. Item issued to 20164 Granville Inverell Hamilton BULLUSS Born 12/11/1909 in Hamilton NSW . He enlisted at Tamworth into the RAAF. Service records not available to the public. R.A.A.F. 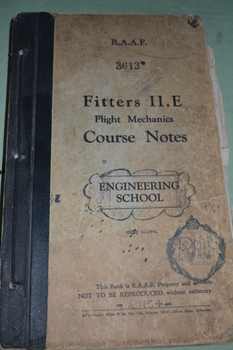 3613 Fitters II.E Flight Mechanics, Course Notes, Engineering School. 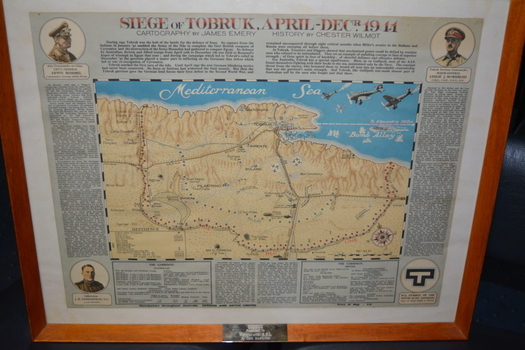 Issue 3 - 1941. This book is R.A.A.F Property and is NOT TO BE REPRODUCED without authority. Inside cover written in ink is numerous names and addresses. 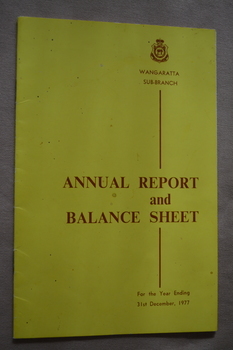 On the front cover is a drawing of clouds and rain and the RAAF crest. Inside on various pages is some sketches in pencil, quite a few of people in profile. 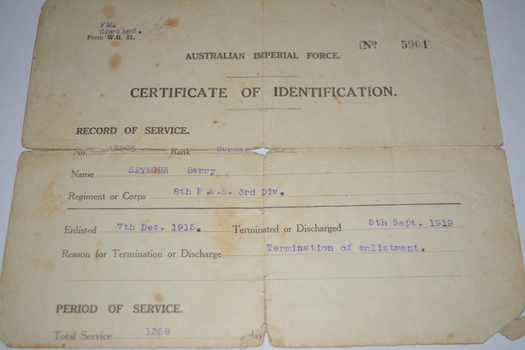 Australian Imperial Force No 5901 Certificate of Identification - Gunner Barry Seymour 8th F.A.B. 3rd Div. 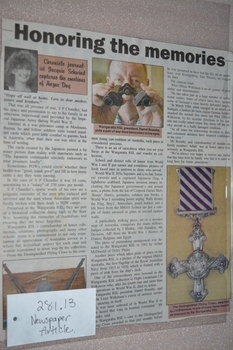 Article relates to several items in the Wangaratta RSL collection including the DFC medal awarded to John Hudson WILKINSON. 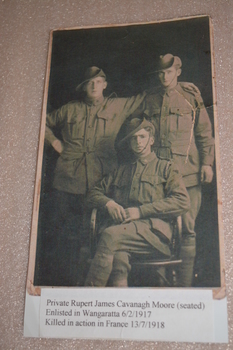 From collection of photographs and cuttings dedicated to the memory of WILKINSON JOHN HUDSON : Service Number - 400444 : Date of birth - 18 Feb 1914 : Place of birth - RUTHERGLEN VIC : Place of enlistment - MELBOURNE : Next of Kin - WILKINSON HUDSON. Wilkinson was awarded the distinguished flying cross in March 1944 and tragically killed in action over Germany also in 1944. See also 237 and 240. Home made tan leather pen case for three pens. Has large yellowing stitching. HMAS Sydney built by Swan Hunter and Wigham Richardson Ltd., Wallsend on Tyne, United Kingdom Launched 22 September 1934 Engaged and sunk Bartolmeo Colleom 19 July 1940. On 19 November 1941 South West of Carnarvon Western Australia she was lost at sea with all hands after engaging the German raider Kormoran. Banner - HMAS Sydney HMAS Sydney built by Swan Hunter and Wigham Richardson Ltd., Wallsend on Tyne, United Kingdom Launched 22 September 1934 Engaged and sunk Bartolmeo Colleom 19 July 1940 Lost at sea with all hands 19 November 1941 South West of Carnarvon Western Australia after engaging the German raider Kormoran.